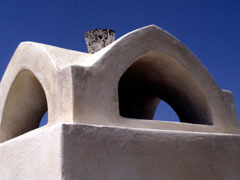 Located approximately in the center of the rim of the volcano, this very busy and multi-faceted community is the center of life on Santorini. From typical tourist shops to bars that feature classical music, to restaurants and discos, there is much to learn, see, and do. 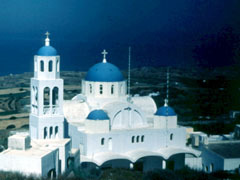 The Greek Orthodox Cathedral in Thira: a multitude of arches soaring towards the heavens. 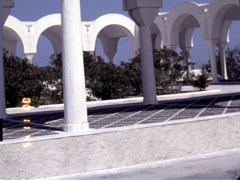 The arcade adjacent to the Cathedral: The capitals are more like impost blocks from a Byzantine tradition, but modernized through stylization. Inside the Cathedral's arcade. Notice what shadow can do to a composition, or merely to one's visual aspect of a place - it adds another dimension. 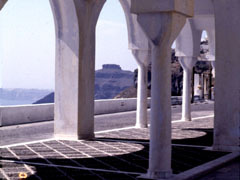 The verticals play against the arches, and the diagonals of the ground pattern play against both. 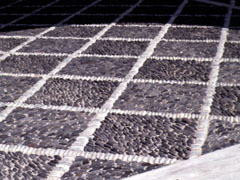 The flooring involves changes in material, color, pattern, and texture. We are going to see a lot of this as we study; not just one change or contrast, but often two, three, and four differences. The number of contrasting elements adds to the visual perception of the object! Keep an eye out for such contrasts, even if not specifically mentioned. 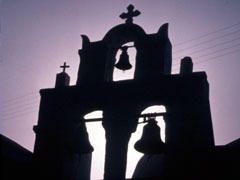 A church and bell tower complex. The tower is quite delicate, open and airy. 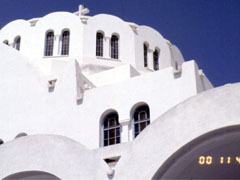 The smaller domes and barrel vaults undoubtedly buttress the larger central one of the church. See "Hagia Sophia" below for similar Byzantine ways of construction. 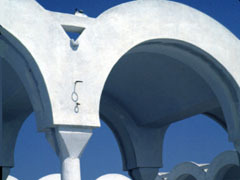 Notice that the four barrel vaults (one is mostly hidden behind the drum of the dome) form a Greek cross, the basic building shape of Greek Orthodox religious structures, in part based upon Byzantine tradition. 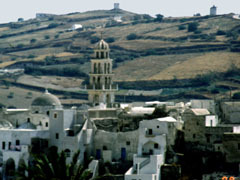 In a small coastal area on the outer edge of the island, the town of Emborio lies 12 kilometers (7.5 miles) from Thira. It was very hard hit by the last earthquake and was rather deserted in the late 1980's, but it seemed to be making a recovery. The tower is undoubtedly painted white by now. This particular tower was all the more striking because it is so very delicate. 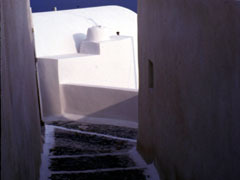 What is so good about this scene is the fact that the view beckons you around a turn, as the stair/ramp twists and turns. This is the beginning of what can be called "serial vision." That is, the situation in which something attracts your attention, and once there, something a distance farther recaptures your attention, and you wind up going through a serialization of spaces and places through space and time. Now we begin a series of "picture postcard" shots taken all over the island. The Greeks are very adept at advertising the beauty of their villages, and it is views such as this and the following that really are quite compelling. 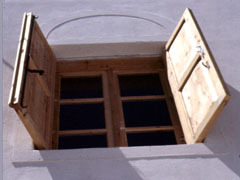 Notice the reduplicated arch over the window, the shadow created by the delicate molding at the sides and bottom. 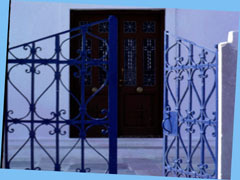 Blue wrought iron framed against not only white walls, but also a very dark door. Quite striking. A chimney top is the result of creative designing. 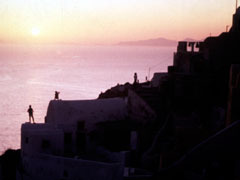 Santorini has character day and night. The silhouettes turn from white to black as the sun sets, almost a negative of the stark white against deep blue daytime sky. There is a constant feeding of the senses around the clock. 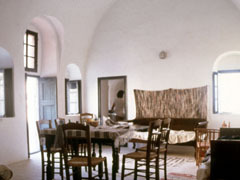 Inside one of the villas: This was actually the house of the film "Summer Lovers" mentioned above. It is comfortable, quite airy, and bright. 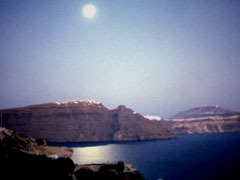 The Sun rises on the eastern lowland side of the island, comes up over the crater in mid-morning, and sets into the Aegean Sea off of Oia. Nature becomes something to contemplate in the middle of the Sea. It is, literally, awesome. And the Moon follows the Sun; it, too, comes up over the caldera, and when it is full it almost turns night into day. When the Moon is not in the heavens, there is no light whatsoever. Think of all of the different views that manifest themselves. These are the kind of things that architecture should be. We have verticals, horizontals, straight lines, curves, variety, interest, excitement, a sense of life, and a play of light, shade, and shadow. In just several slides we have seen so many elements and so many ingredients of what architecture can be. Not to copy - the arches and bell towers - but the effects, chiaroscuro, for instance, the play of light against dark. And the ground textures and patterns, the changing of material, texture, and color, to create those patterns. And what you should begin to notice is that shadow can create its own design. Perhaps we take the wonderful play that shadows can be for granted, for it is rarely planned. These are principles to be studied and thought of, in life, not just this course. People creating shelters amidst a most improbable terrain; dwellings clinging precipitously to the faces of cliffs. And what makes this even more improbable is the fact that there is virtually no potable water on the island; it is shipped in, pumped to the rim of the volcano, and gravity takes it to the structures below. Water is captured in cisterns when it rains. The flow of water is severely limited, and we've had some of our students run out of water in the middle of a soapy shower. You could say that this shows the indomitable spirit of man successfully fighting the forces of nature, gravity included. You could also say that something almost perverse in the nature of humans takes them to build in the wrong places. Think hurricanes along the East Coast of the United States, particularly Florida. Where is the densest population? Same places! Think of raging floodwaters of the mighty Mississippi, a yearly event resulting from melting snow upstream. What gets flooded on an annual basis? Homes, farms, towns. Think of the dormancy of Mt. Vesuvius, which, when active, once buried 20,000 people in Pompeii. Where are people building today in the Bay of Naples - why, up the slopes of Vesuvius, of course! Some say 'indomitable spirit of man,' others say 'foolishness.' You make the call. But you have to admit, Santorini is impressive, beautiful, awesome, and interestingly takes you back to nature almost like no other place on earth.